We are very excited to have been nominated as one of 15 UK hop growers taking part in the Innovative Farmers Field Lab project exploring alley cropping and how to improve hop soils. Innovative Farmers is a not-for-profit network that gives farmers and growers research support and funding on their own terms. 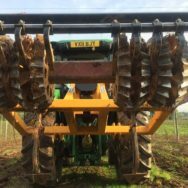 This project is looking to develop practical ways to improve soil structure and organic matter by using carefully chosen cover crops. The soil challenges faced by hop growers are unique because when hops are harvested, the entire plant is removed from the hop yard so very little organic matter is returned to the soil as part of the normal cropping cycle, which means that the soil becomes depleted. 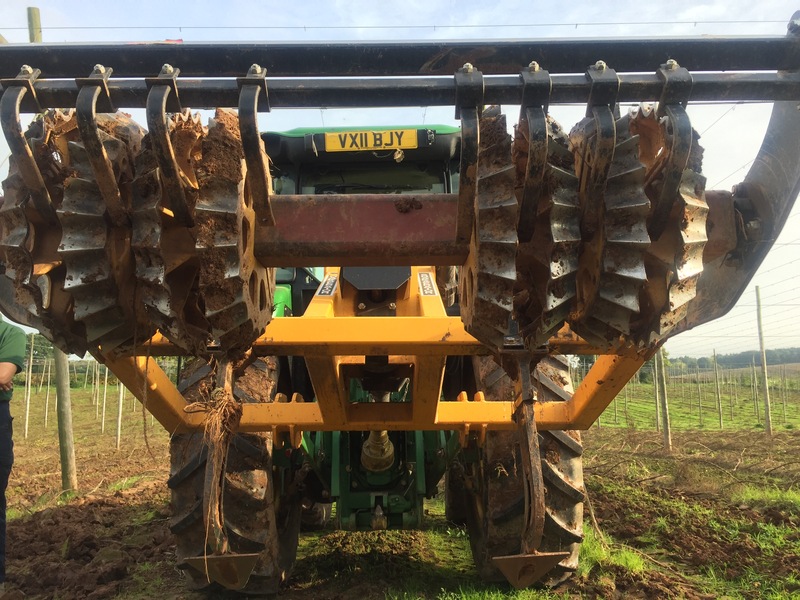 The shakerator in the picture is used to agitate the soil that has been compacted by the hop picking machinery, but it doesn’t disturb the hop roots as it doesn’t penetrate too deeply. By increasing soil organic matter, it is hoped that there will be less soil erosion, increased earthworm populations and better water management, resulting in a more nutrient-rich setting for the hops which should improve fertility, crop health and ultimately improve yield. The field lab will explore cover cropping as a way of putting organic matter back into the soil to reduce depletion and maintain healthy soils, both for existing plants and future crops. The cover crops must be suitable for late summer/autumn sowing, easy to establish, tolerant of poor seedbeds, fast growing and must not become a reservoir or nursery for wilt, so part of the research will establish which crops are most suitable for this. The project runs from September 2017 to September 2018 with an initial evaluation expected in Spring 2018. Results of the experiment will be published on completion. To follow the field lab’s progress and learn more about Innovative Farmers, click here.